The idea of making a road trip through southern Germany somehow made it to my bucket list for our round-the-world-adventure. 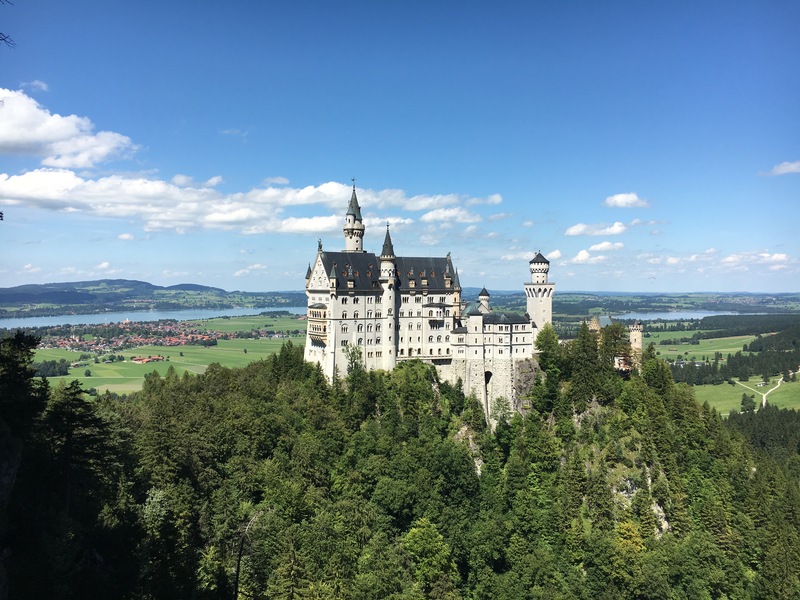 It began with the idea of seeing a few castles and progressed to a journey along the Romantic Road before continuing all the way to Cologne. 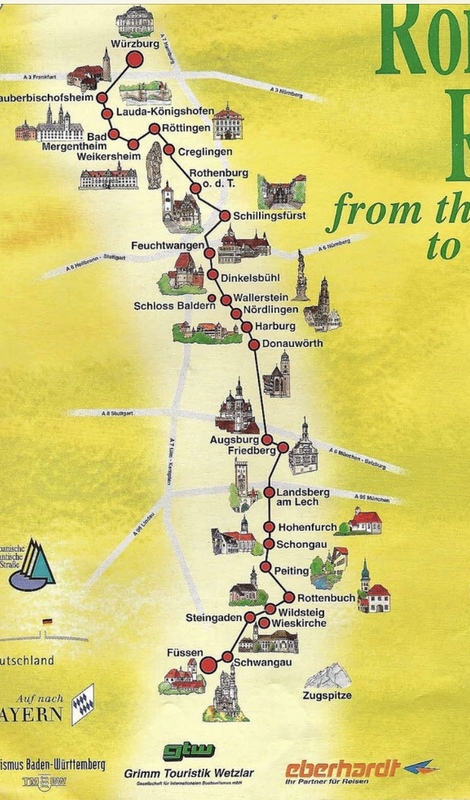 First, I had no clue what the Romantic Road was or what it meant, but once I booked our train to Munich I knew I had to figure it out. It is basically Germany’s best known and most popular holiday route that winds through Bavaria from Wurzburg to Fussen. This drive passes through numerous cities and towns welcoming visitors to a wealth of European history, art and culture. 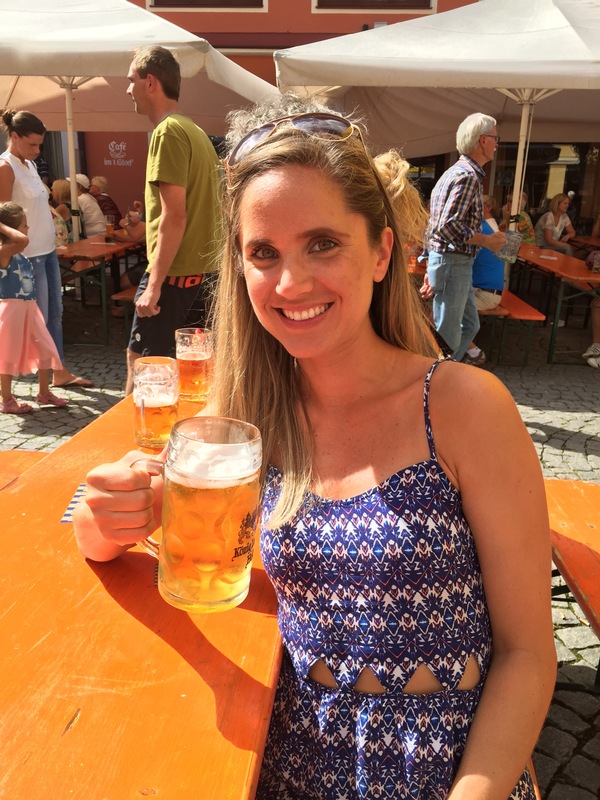 I read through tons of articles and blogs to come up with a basic 5 night itinerary to get us from one end to the other travelling in the opposite direction of most tours. Hopefully, I am able to share our story with a few tips along the way and without boring you with too many details of each town. 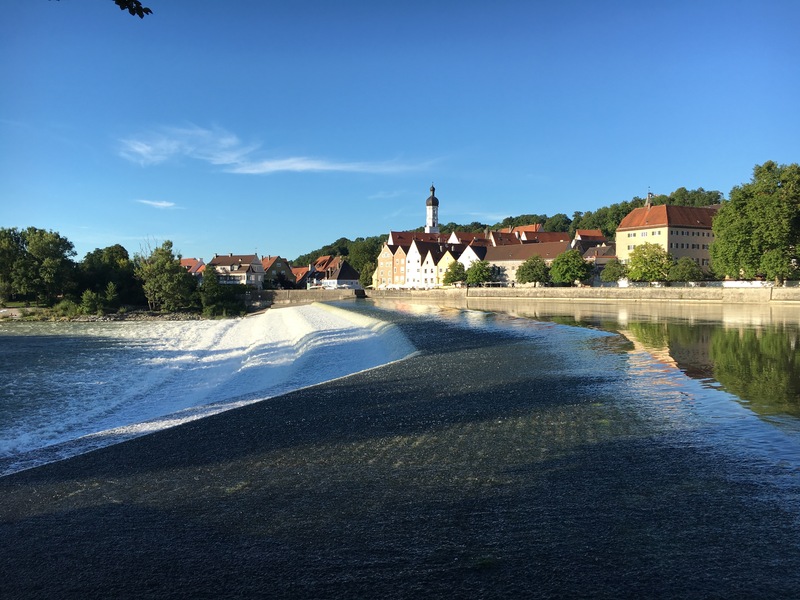 We picked up our rental car at Munich airport in the early afternoon and headed straight out to Landsberg am Lech for our first night. We were so excited to get on the road and were looking forward to the apartment we booked on Airbnb as it was our very own unit after spending the last few days in hostels in Switzerland. Checking in to our apartment we were strongly encouraged by our host to go downtown to check out the city. 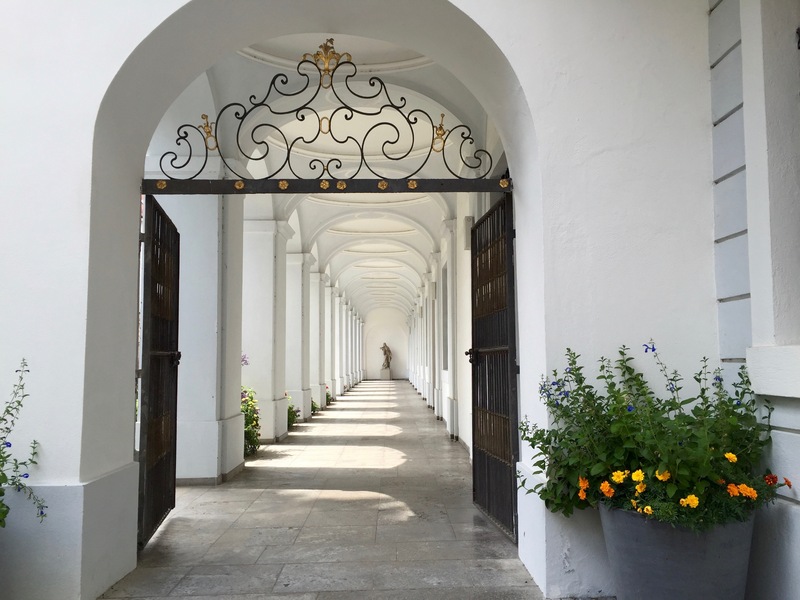 This beautiful town sits on the River Lech surrounded by historical city walls. The panoramic view of the city looking over the river set the stage for what was to come over the next few days. There are a number of restaurants along the river that would be the perfect setting for an afternoon or evening drink, so try to squeeze this in if you are passing through. Technically our first day was a travel day, so I’ll just carry on into the next morning as if it were Day 1 just to simplify things for myself. 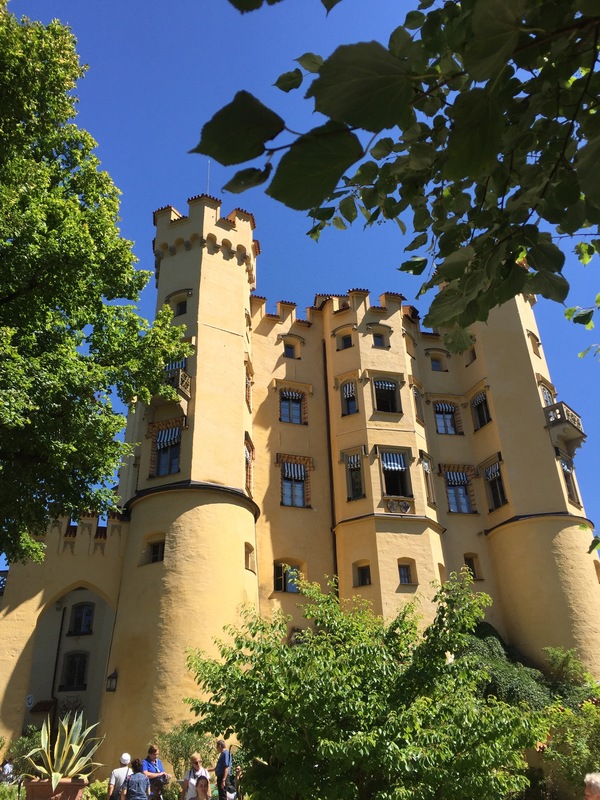 We left Landsberg am Lech early in the morning for Schwangau to see the Neuschwanstein and Hohenschwangau castles. We researched each of these previously and didn’t feel that touring the inside was particularly of interest to us. However, if this is something you want to do, be sure to book a tour in advance as we couldn’t have visited even if we wanted to since they were already sold out when we got there. 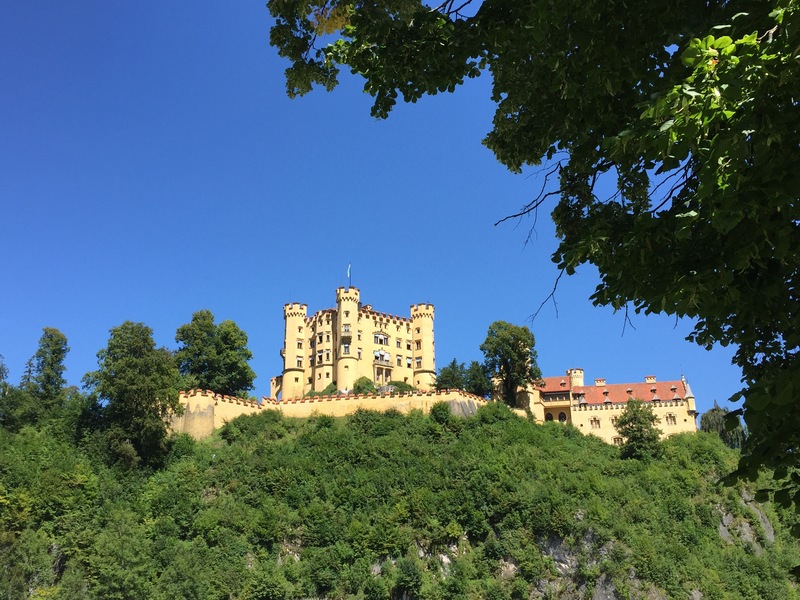 Our first castle of the trip was Hohenschwangau. It was a short walk up from the main town until we were circling the castle walls. 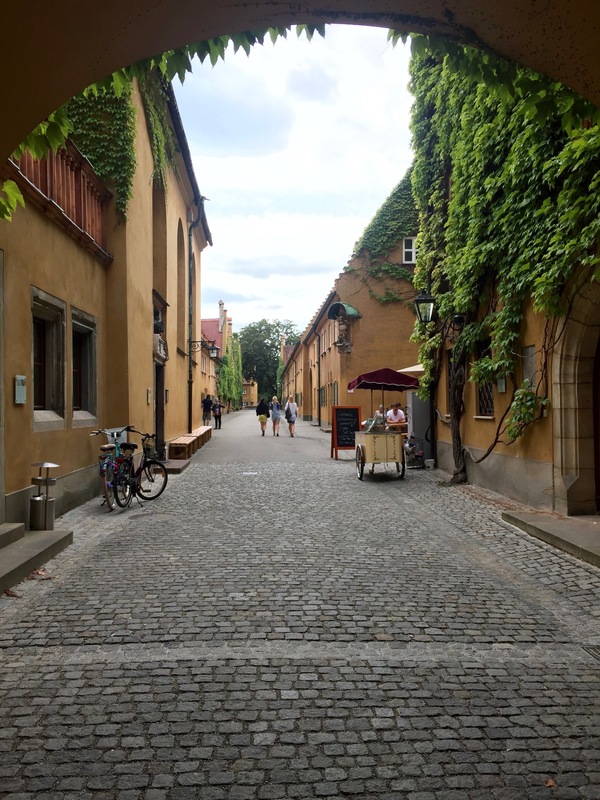 It’s always fun to imagine it as if it’s your home…until we got to the turnstile and simply circled the building. From here we could see the picturesque Neuschwanstein in the distance. It was time to hike a couple kilometers to the top. Alternatively, there is a horse carriage that will take visitors to the castle itself for 6 euro (I think), but we walked it ourselves as usual. Without a ticket we were able to walk around the entire outside and even into the courtyard of Neuschwanstein. After seeing it up close, we followed the crowd around to the bridge that overlooks the area to get the famed fairytale view of the castle looking out over the valley. 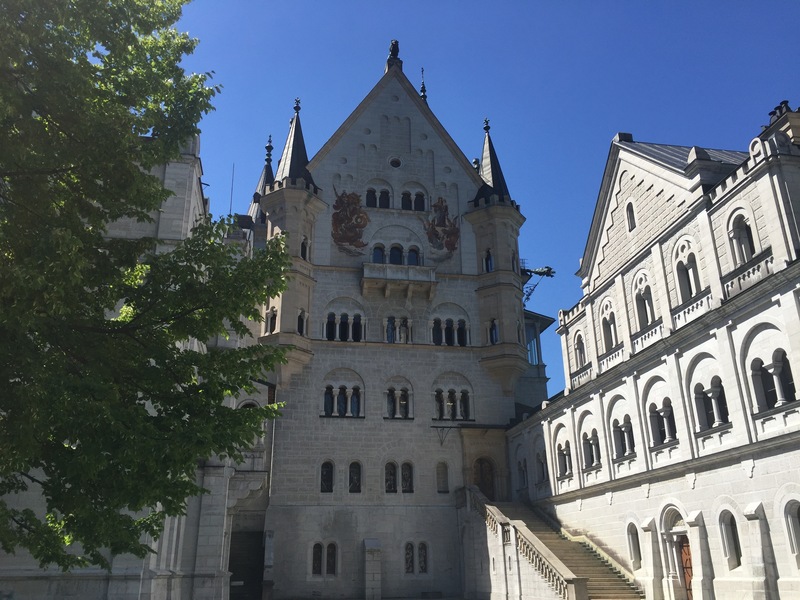 We made our way back to the car and drove down into Fussen which is the official ending point of the Romantic Road, but since we were driving the route in reverse, it was just the next stop at the beginning of our trip! 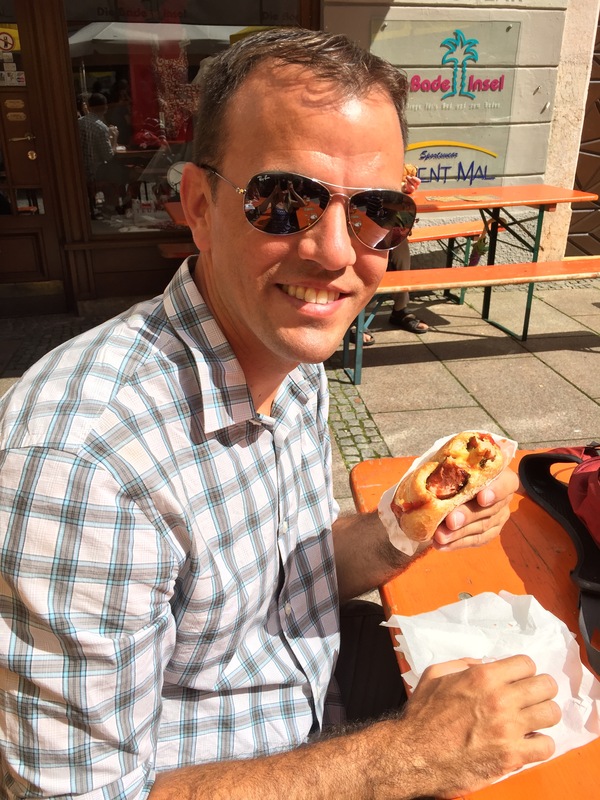 We happened to arrive during the times of summer celebrations and were welcomed into the downtown with live music, beer gardens and multiple options for our new favorite food, the Bratwurst! 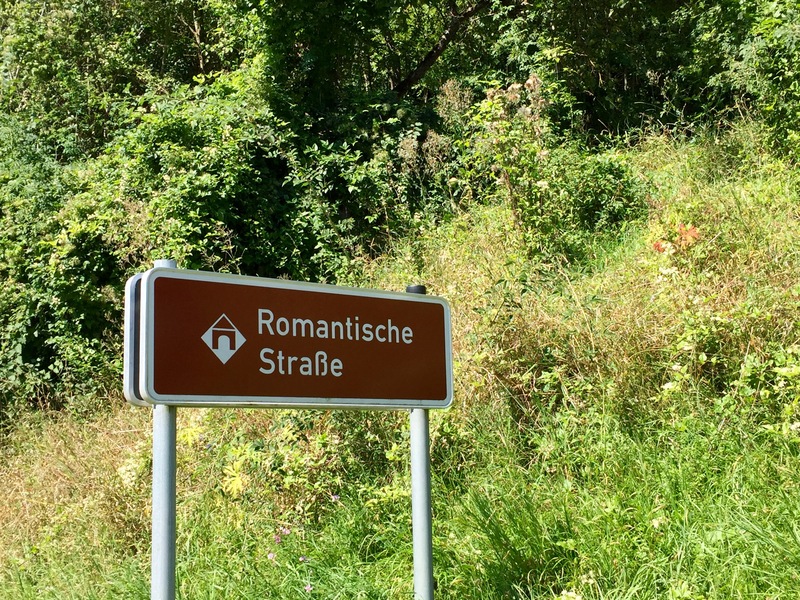 Now that we were officially on the Romantic Road, we began to follow the scenic road with its brown signs leading us in the right direction. I can’t even begin to list all the towns we would drive through as many were only a cluster of buildings and homes, some without any obvious businesses, but all with their own name. 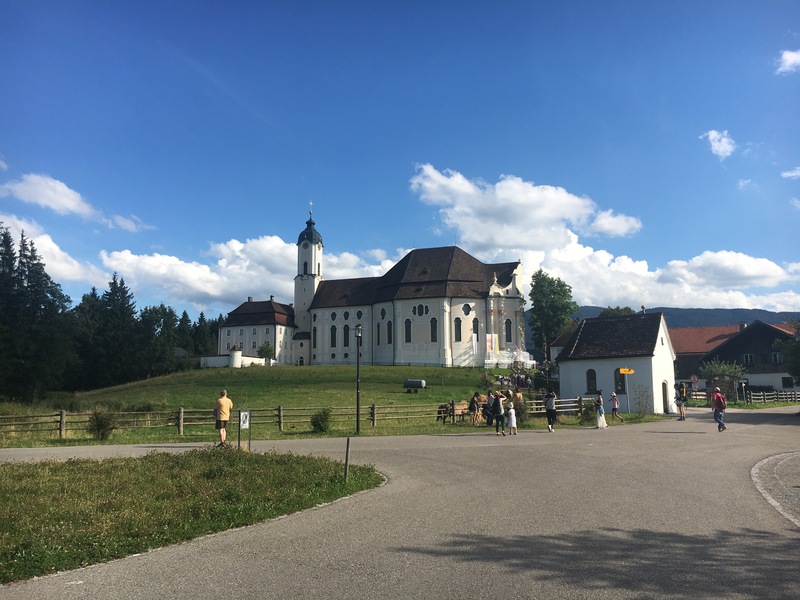 The last stop we made on our first day was to see Wieskirche (Wies Church) described as the epitome of Bavarian rococo church. I have yet to be comfortable taking any photos inside a church, but I want to describe this as best I can. Think of all the action figures or plastic dolls that you had as a child. Try to imagine the same figurines about 2-3ft tall with the appearance of men and women 1000 years ago. Or try to imagine every religious painting that you have seen and envision the characters in the paintings as these figures in front of you as you sit in the pews. There must have been a hundred of these built into the monuments that make up the church. Needless to say, this stop was definitely worth it. The last town we visited was Friedberg just before entering Augsburg. It was late on a Sunday evening so most places were closed. The town had a nice city center that must be more welcoming at other times. We simply stopped in for dinner before calling it a night. Actually, it wasn’t that simple; nearly everything was closed as we walked a few of the streets in this town. We ended up having dinner at a Michelin Star restaurant instead of the one bar that was open. Whitney was happy and feeling right at home, but our wallets were not. 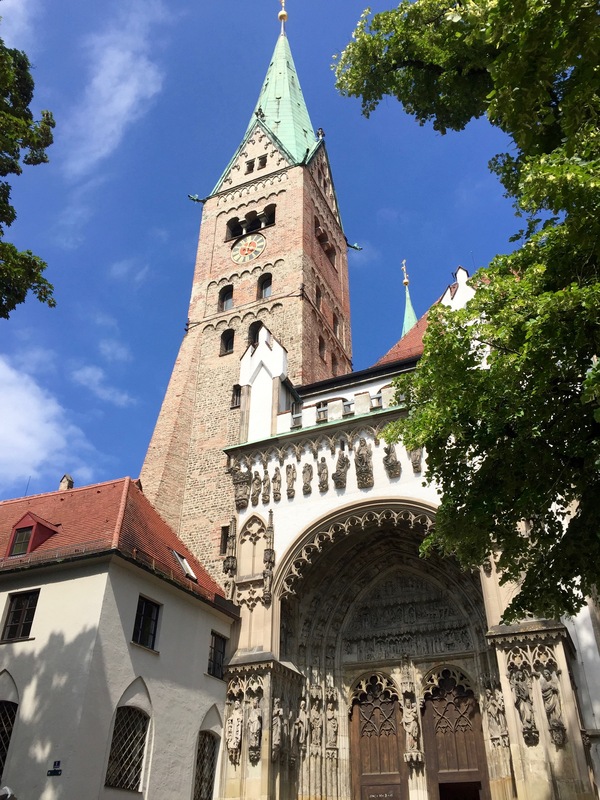 We spent our second night in Augsburg arriving late in the evening after a packed first day. We got moving a little slow on day 2 and headed into downtown Augsburg. Our first stop was the information office in the main square where we got a map with a couple options for self-guided walking tours. We simply followed the map to a few of the highlights of the town. For the most part, everything to see is near Maximillian Avenue. We were first drawn to a large church at one end of the Avenue, we then ventured off the main road to see the oldest subsidized housing project in the world, where tenants still pay only about 1 euro a year in rent. 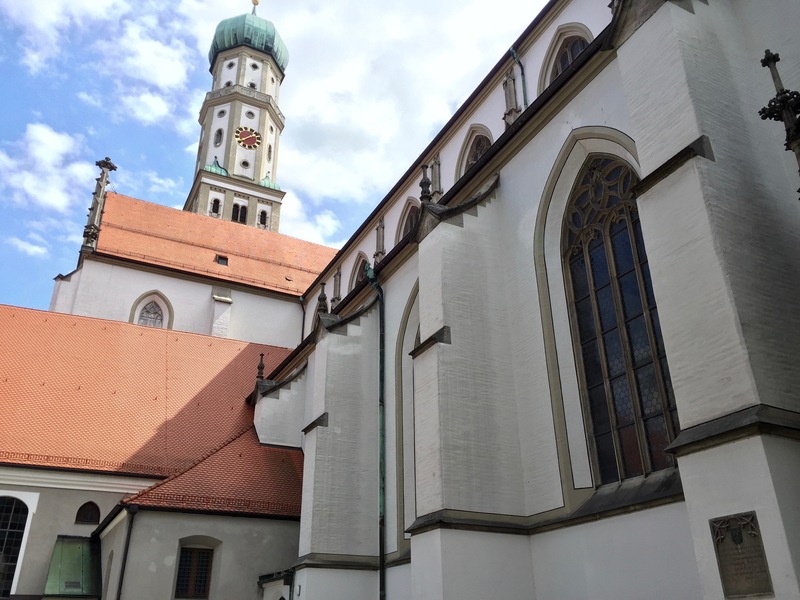 We continued on past other tourist attractions that included a palace, a couple museums (we still aren’t excited about museums; New York had enough to go around), and finally another large church at the other end of Maximillian Avenue. 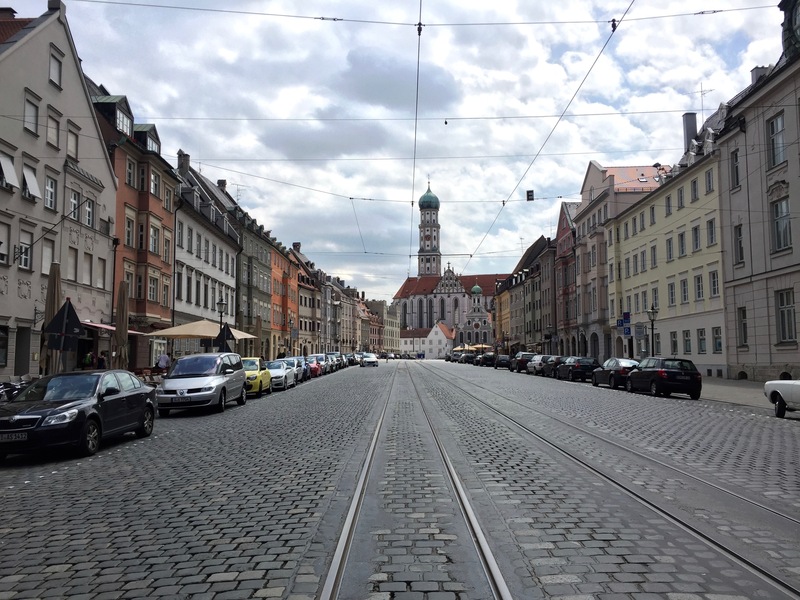 Next, we left Augsburg for Ulm. 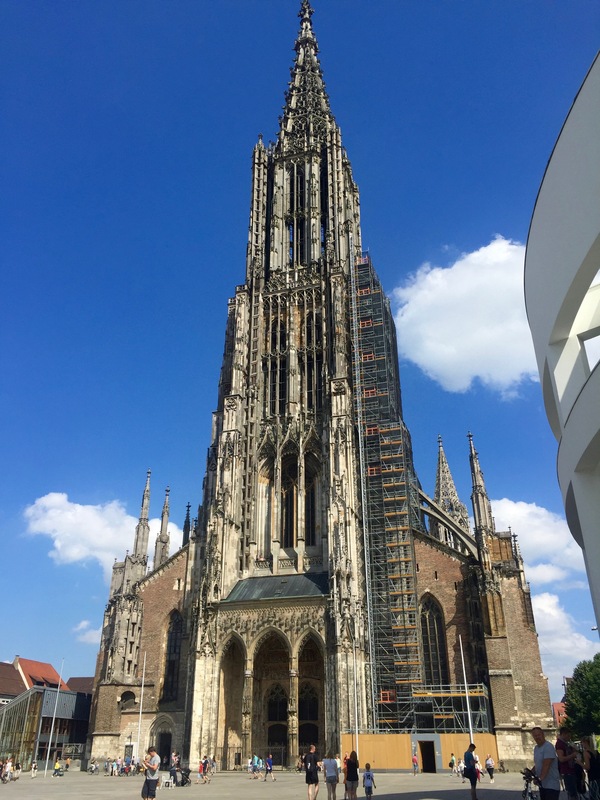 Whitney came across the Ulm Cathedral online and was set on climbing to the top of the tallest steeple in the world. This was a bit of a deviation from the traditional Romantic Road route, but I was happy to be her chauffer. Happy wife, happy life. There was a lot of construction surrounding this town, however, once into the downtown we were excited to see the area. We made our way down one of the main streets past numerous shops until we were looking up at the massive facade of the cathedral. We didn’t hesitate to get inside, purchase our 5 euro tickets to the top and climb the 700+ stairs to the top. The views from above were spectacular. We left Ulm hoping to get to our next Airbnb in Aalen before dark. 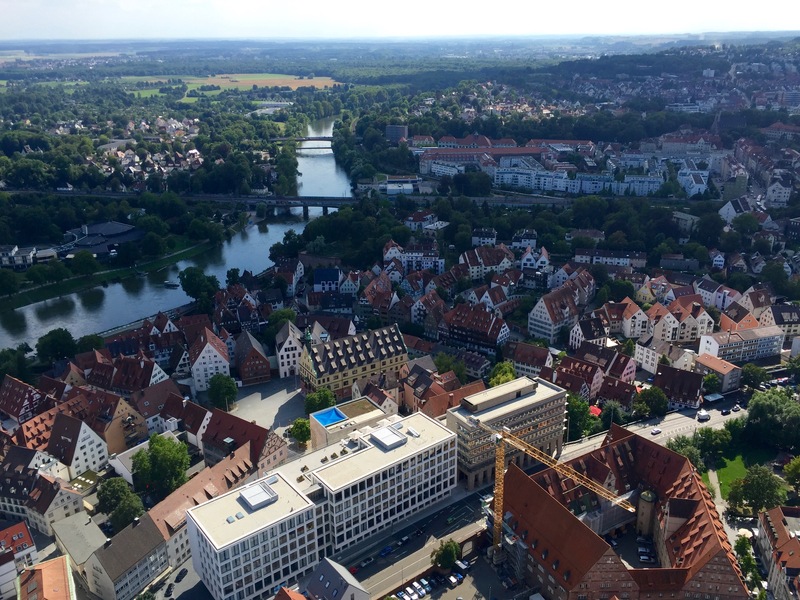 Aalen is about 15 minutes outside of Nordlingen, one of the usual recommended stops on the Romantic Road. We arrived a little after 5pm only to find our Airbnb host was not in town to let us in. Instead our host had booked us into a local “hotel” on the edge of town (it was old, dingy and had one 1 bathroom per floor for all the rooms). 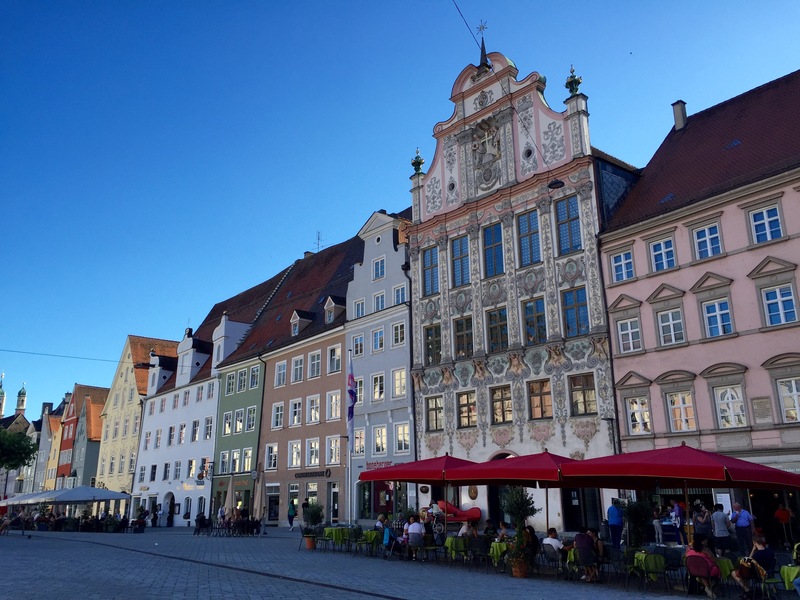 Once checked in, we made the best of our remaining time in Aalen and wandered back into the downtown area for dinner. We settled on a Greek Restaurant that was quite delicious to complete our day. 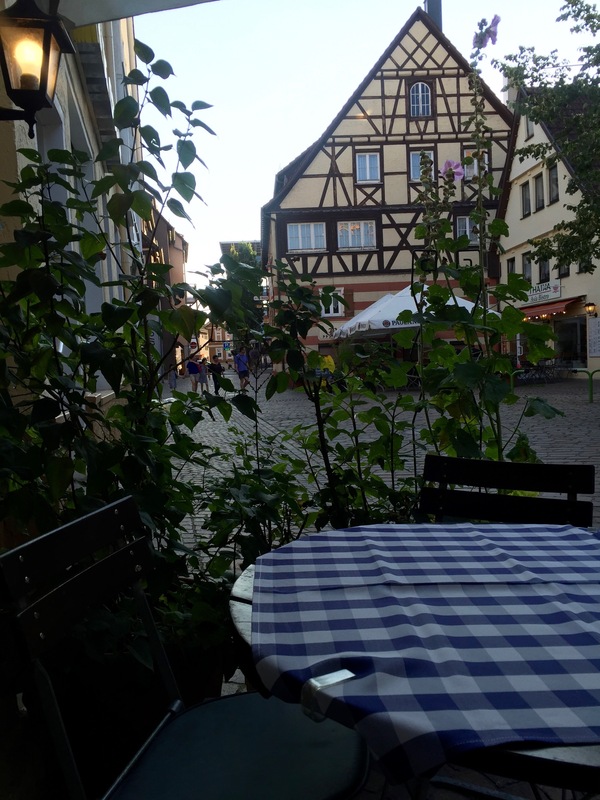 Downtown Aalen – Dinner with a view! 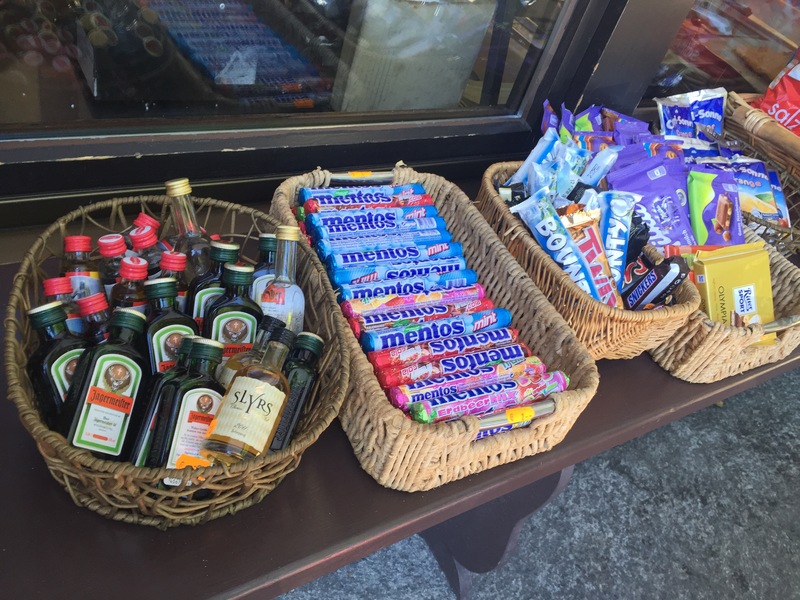 We saw so much on this road trip that we decided to split it into 2 parts. 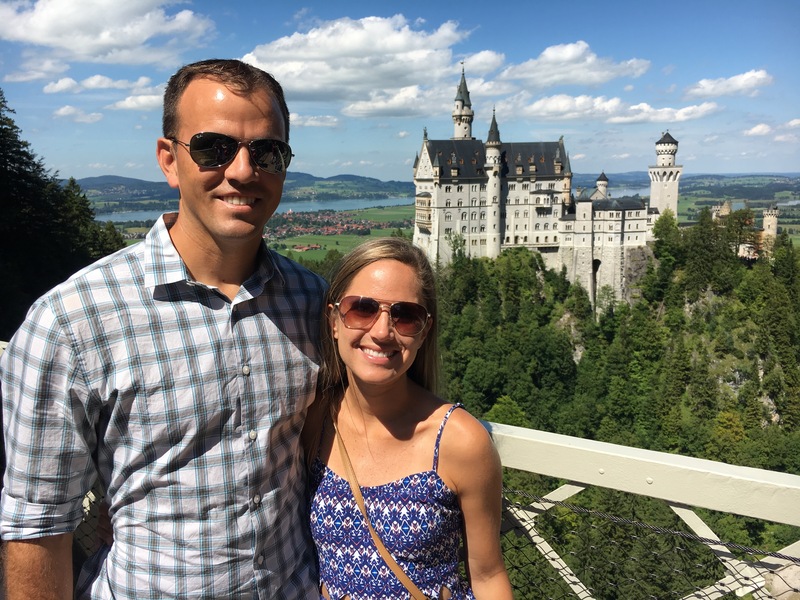 Continue to follow along in Part 2 of Exploring the Romantic Road.